Drawer Qty. Front Drawer Height Total Compt. Overall Ht. Overall WxD Stock No. $ 9 (4) 4'', (4) 6'', (1) 8'' 200 48" 36x24" M2285✧ 2053.00 9 (4) 4'', (4) 6'', (1) 8'' 200 48" 48x24" M2286✧ 2517.00 LIFETIME WARRANTY LIFETIME WARRANTY Key Drawer Qty. Front Drawer Height Total Compt. Overall Ht. Overall WxD Stock No. $ A 5 (3) 4'', (1) 6'', (1) 8'' 104 32 1 / 4 " 36x24" M2280✧ 1454.00 B 7 (2) 3'', (2) 4'', (2) 6'', (1) 8'' 152 40 1 / 4 " 36x24" M2281✧ 1905.00 C 9 (1) 4'', (2) 5'', (4) 6'', (2) 8'' 184 60 1 / 4 " 36x24" M2282✧ 2472.00 D 7 (2) 3'', (2) 4'', (2) 6'', (1) 8'' 152 40 1 / 4 " 48x24" M2283✧ 2386.00 E 9 (2) 4'', (2) 5'', (4) 6'', (1) 8'' 224 60 1 / 4 " 48x24" M2284✧ 3455.00 2 Closed Shelving Units - 4 Shelf (sold separately) A B C D E M1302✦ 36"Wx24"Dx76"H. $...........................................................................................376.00 M1303✦ 36"Wx24"Dx88"H. $...........................................................................................389.00 M1304✦ 36"Wx24"Dx100"H. $ ........................................................................................418.00 M1305✦ 48"Wx24"Dx76"H. $..........................................................................................454.00 M1306✦ 48"Wx24"Dx88"H. $..........................................................................................473.00 M1307✦ 48"Wx24"Dx100"H. $ .......................................................................................509.00 Integrated Drawer Systems for Shelving • 18–20 gauge steel • 440-lb. 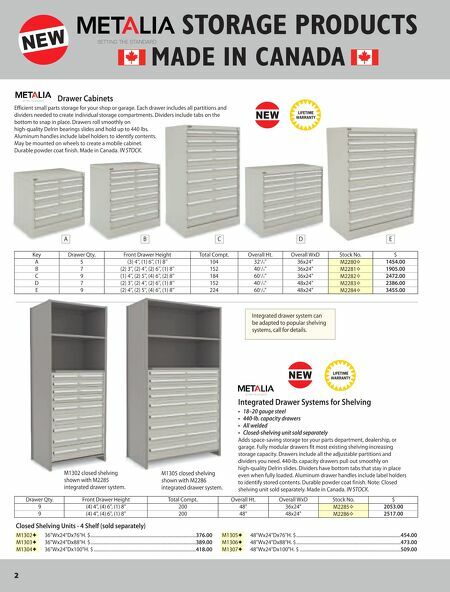 capacity drawers • All welded • Closed-shelving unit sold separately Adds space-saving storage tor your parts department, dealership, or garage. Fully modular drawers fit most existing shelving increasing storage capacity. Drawers include all the adjustable partitions and dividers you need. 440-lb. capacity drawers pull out smoothly on high-quality Delrin slides. Dividers have bottom tabs that stay in place even when fully loaded. Aluminum drawer handles include label holders to identify stored contents. Durable powder coat finish. Note: Closed shelving unit sold separately. Made in Canada. IN STOCK. M1302 closed shelving shown with M2285 integrated drawer system. 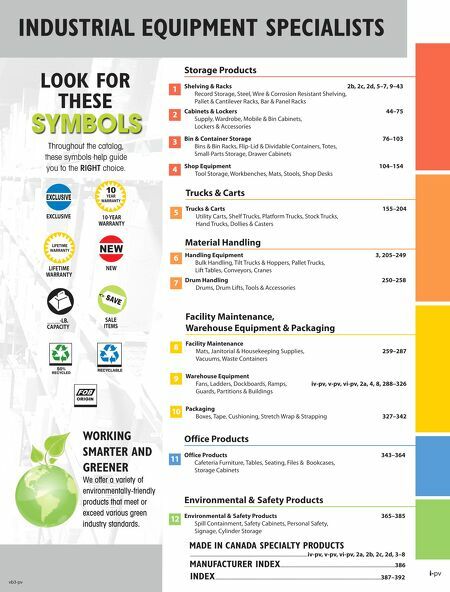 STORAGE PRODUCTS MADE IN CANADA NEW NEW NEW Drawer Cabinets Efficient small parts storage for your shop or garage. Each drawer includes all partitions and dividers needed to create individual storage compartments. Dividers include tabs on the bottom to snap in place. Drawers roll smoothly on high-quality Delrin bearings slides and hold up to 440 lbs. Aluminum handles include label holders to identify contents. May be mounted on wheels to create a mobile cabinet. Durable powder coat finish. Made in Canada. IN STOCK. Integrated drawer system can be adapted to popular shelving systems, call for details. M1305 closed shelving shown with M2286 integrated drawer system.